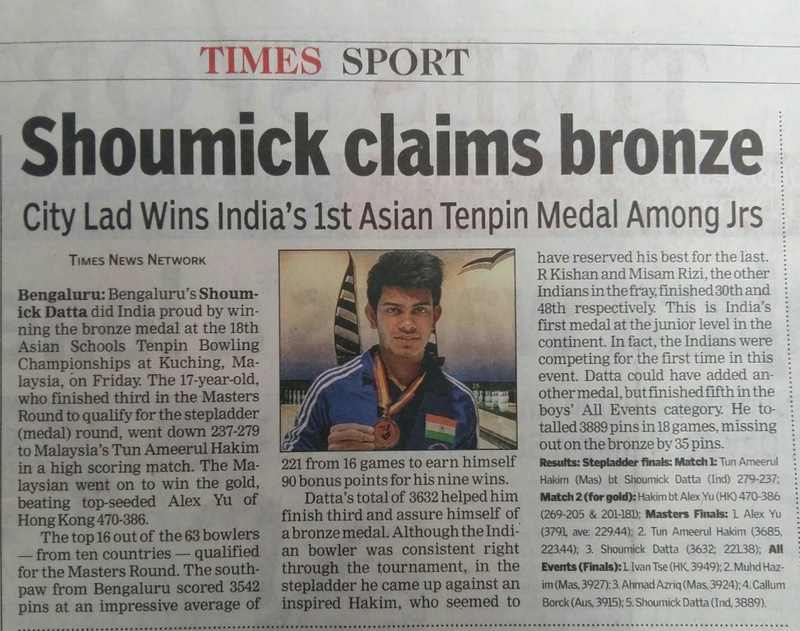 Shoumick Datta bags Bronze Medal ! 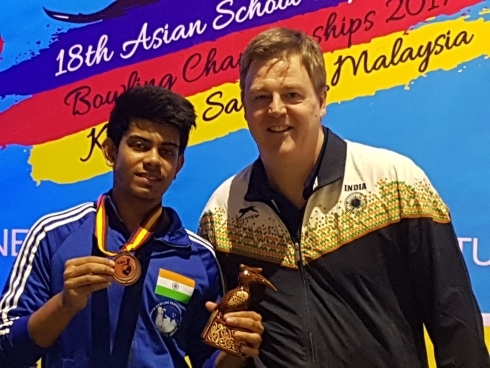 Shoumick Datta of India won Bronze medal finishing 3rd in the Masters Round of the 18th Asian Schools Tenpin Bowling Championships which concluded in Kuching, Malaysia. 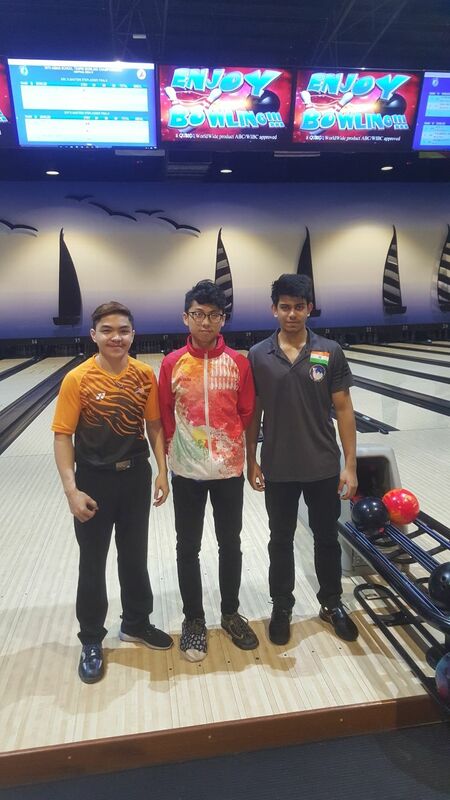 In a high scoring Match 1 of Step ladder Round, Shoumick lost to Tun Hakim of Malaysia by 42 pins( 237 - 279). 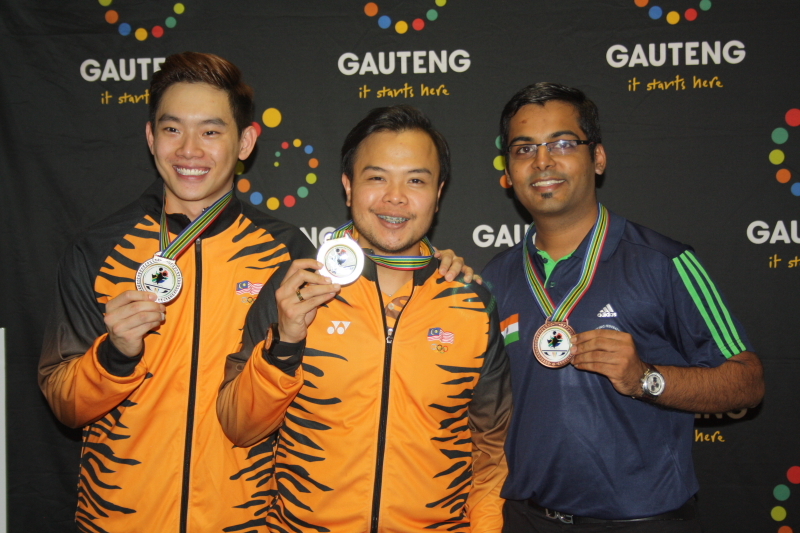 Tun Hakim won the Gold defeating Top Seed Alex Yu ( 470- 386) to bag the Gold. In the Masters Round where Top 16 players ,Played 15 matches and 1 position round game, the 18 year old from Bangalore scored 3542 pins and an impressive average of 221 in 16 games.He earned himself 90 Bonus pins for his 9 wins in Masters Round. 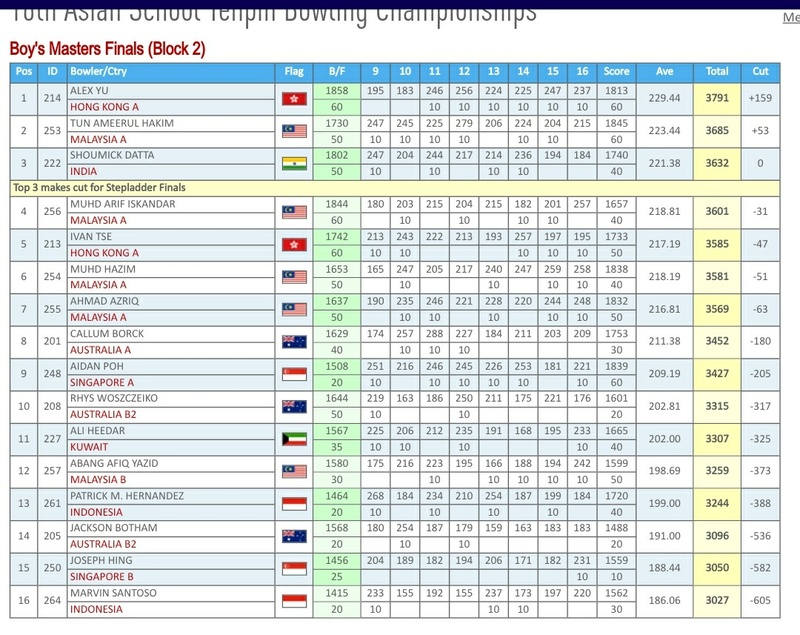 His Grand total of 3632 pins helped him finish overall 3rd and qualify for Step Ladder Finals. 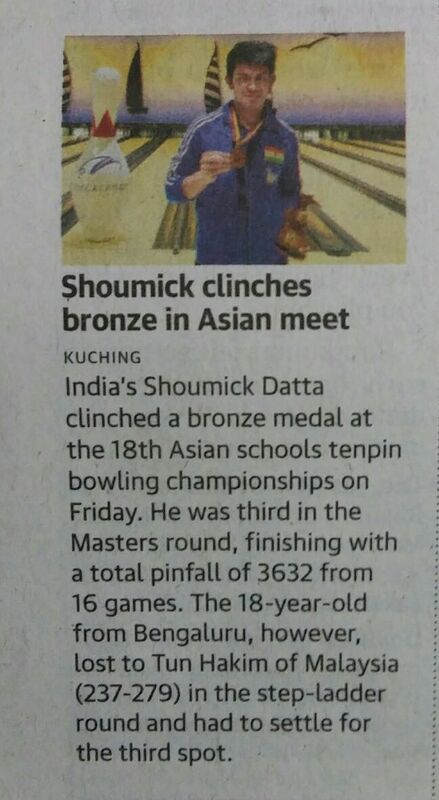 Shoumick , a student of Bishop Cotton Boys School had earlier finished 5th in All Events and missed winning his 2nd medal.His Teammates, Kishan R and Misam Rizvi finished 30th and 48th respectively. 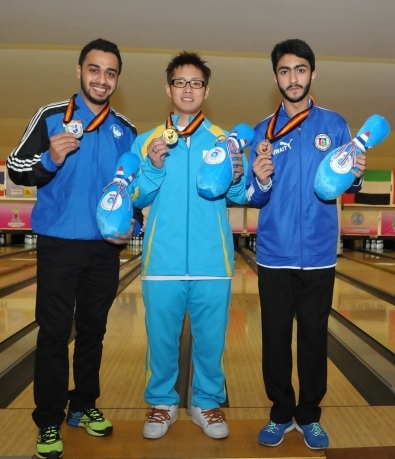 63 bowlers, aged under 18 , from.10 Asian Countries participated in this weeklong Championships . 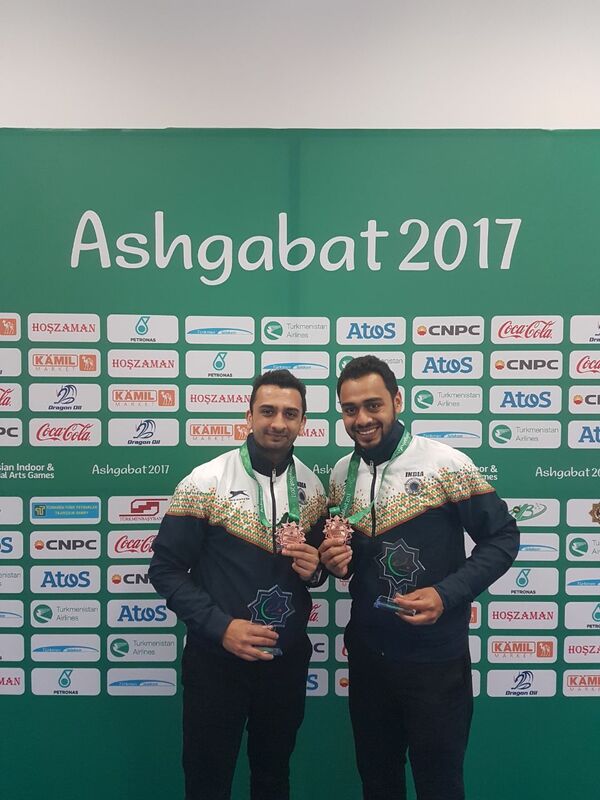 On September 23, 2017 Indian Men's Doubles Team made India proud by winning a Bronze medal of 5th Asian Indoor & Martial Arts Games at Ashgabat. 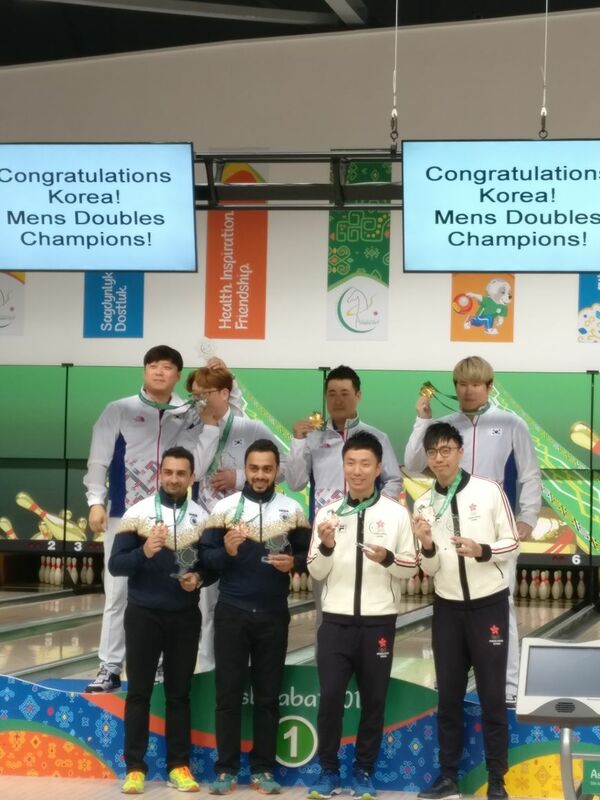 Fifth seed Dhruv Sharda & Shabbir Dhankot lost to the champions, second-seed Cho Young Seon and Kim Kyung Min 458-365 in the semi-final match and had to settle for a bronze medal. 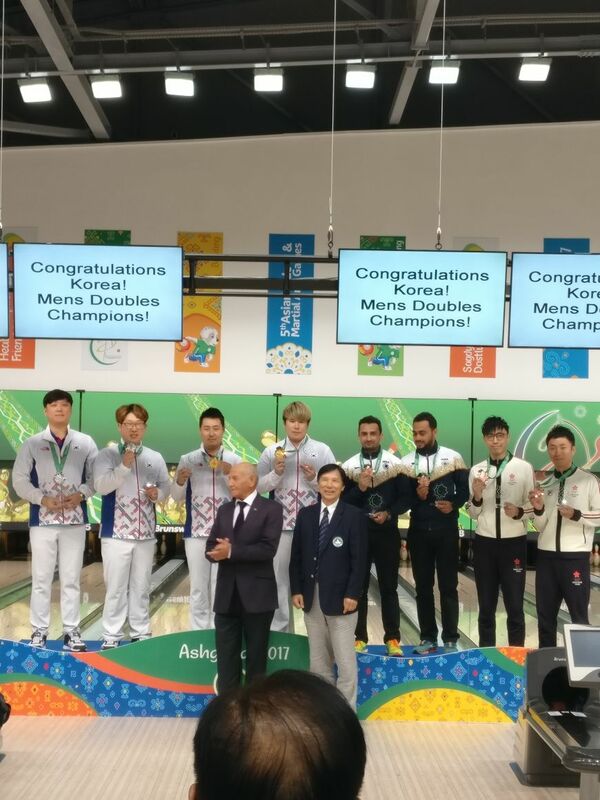 This is 3rd International Medal in last three years for Indian team and if the same form continues then Indian team would be a medal hope in Asian Games 2018. 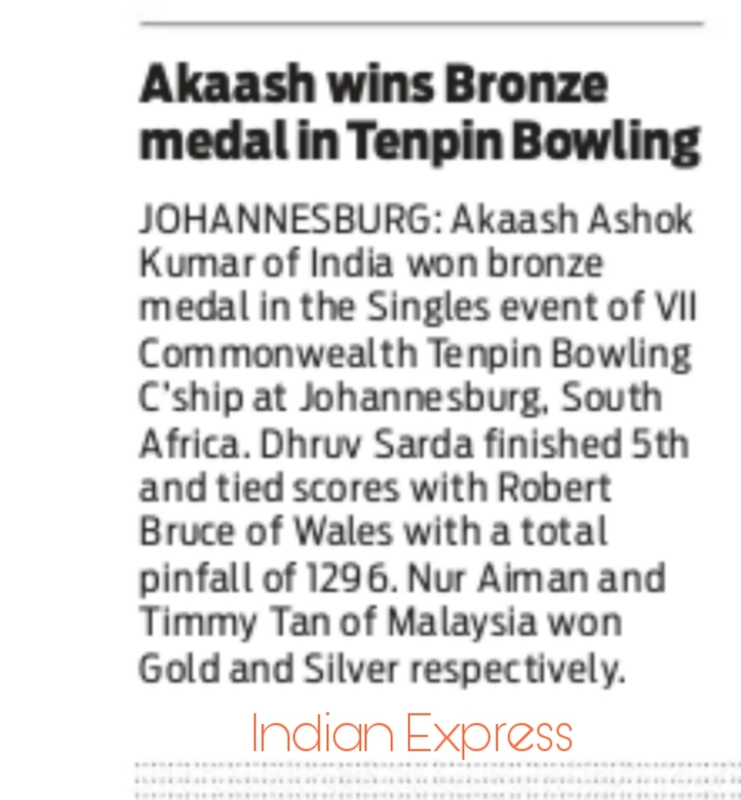 Akaash Ashok Kumar made India proud by winning the Bronze Medal in singles event of Commonwealth Tenpin Bowling Championship 2016 at Johannesburg, South Africa. 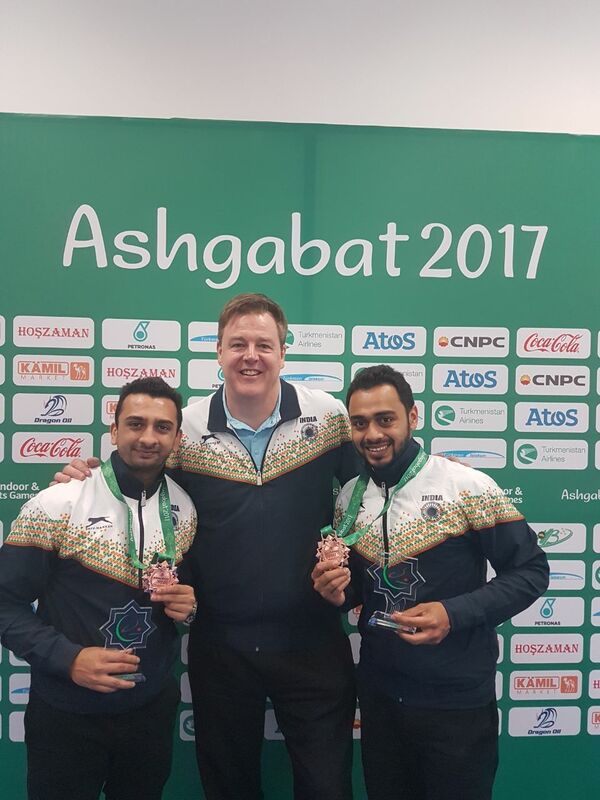 On January 17th 2015, Indian Ten Pin Bowler, Shabbir Dhankot created history by winning first ever medal for India at the 23rd Asian Championships. 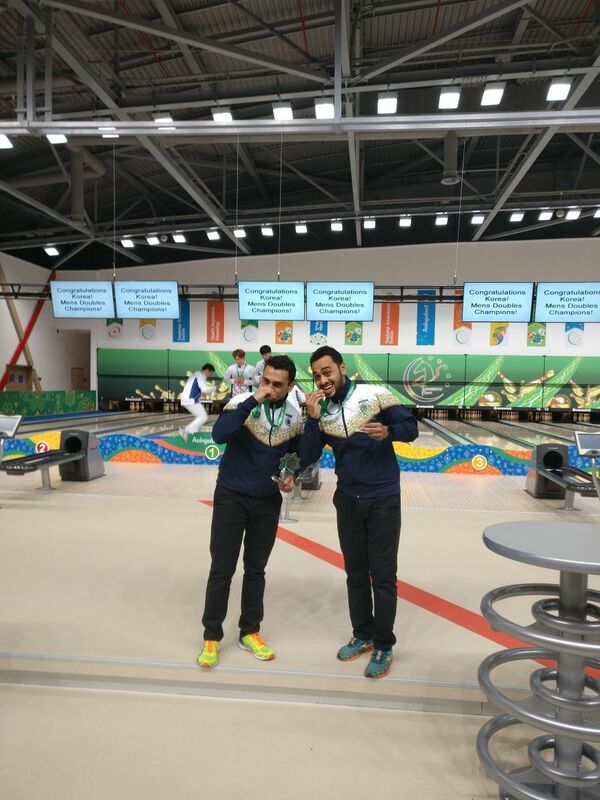 In a very tightly contested Men's Single event, he won the silver with a lead of 1 pin over bronze medalist and missed the gold by just 5 pins difference!! 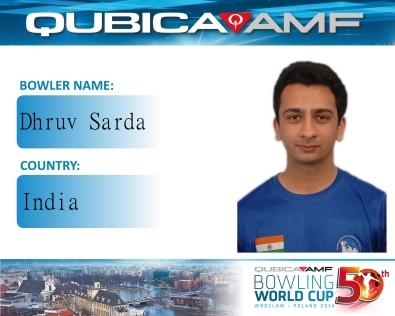 India's ace bowler and multiple times National Champion broke into top 24 at the 50th Qubica AMF World Cup 2014. 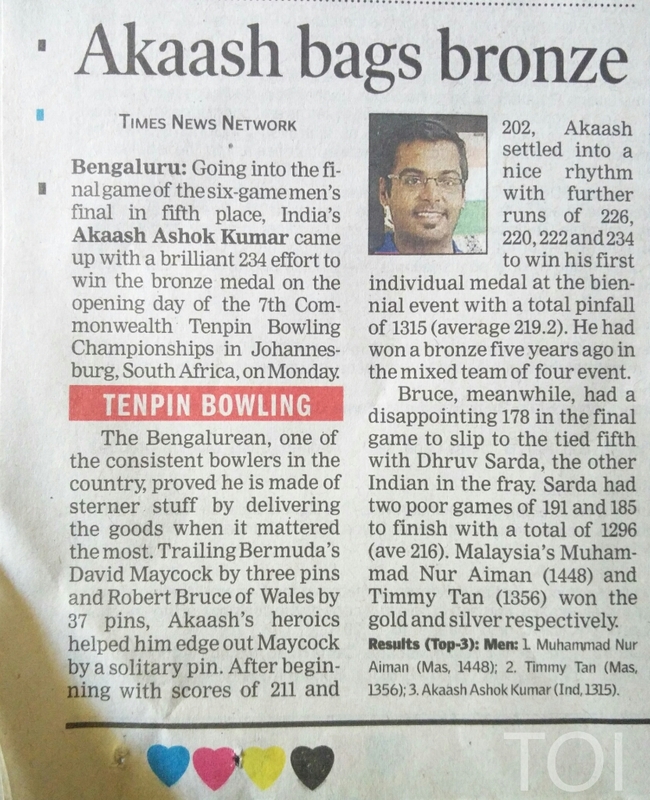 Competig in the field with best bowlers from around the world Dhruv finished with Total Pinfall: 6143 & Average: 219.39. 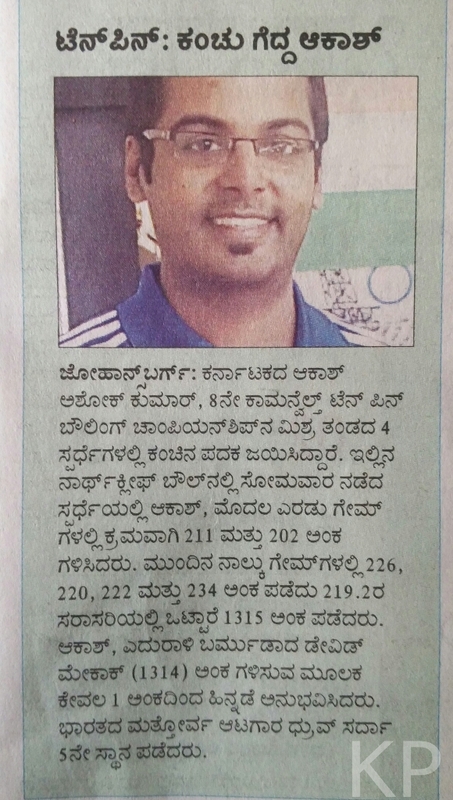 He came very close to scoring a perfect game by getting his highest score 297. 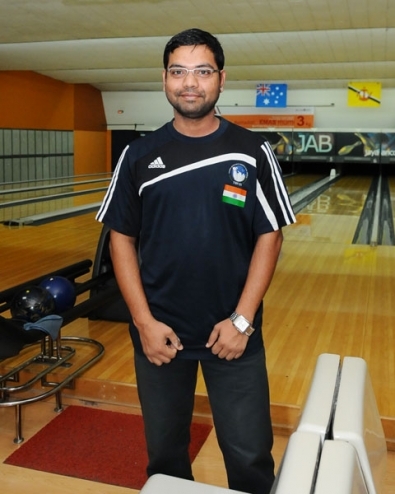 Indian tenpin bowlers continued to improve their performances at the international arena. 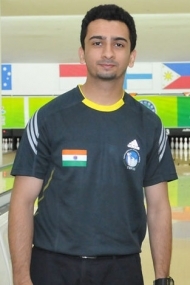 Indian team member Parvez Ahmed entered the step ladder play offs at the 5th position witj total pinfall of 3398 & average of 212.5. However in the step ladder match he could not keep up the momentum and finished 6th. 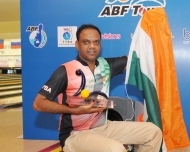 Shaik Abdul Hameed of India captured his first-ever Men's ABF tour titles at the ABF Tour Thailand 2014 at Blu–O Rhythm & Bowl Ratchayothin in April 2014. 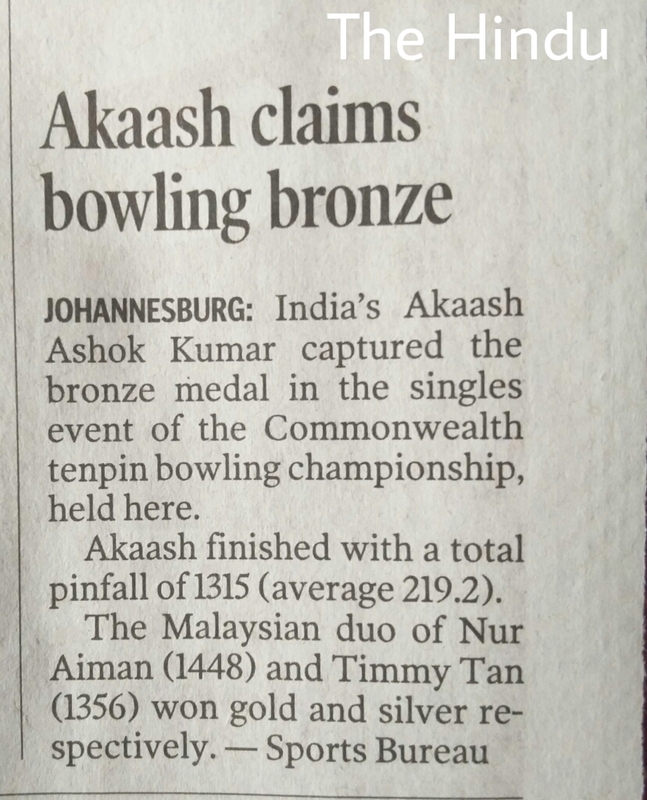 This is hisotric first for Indian Tenpin Bowling as well. 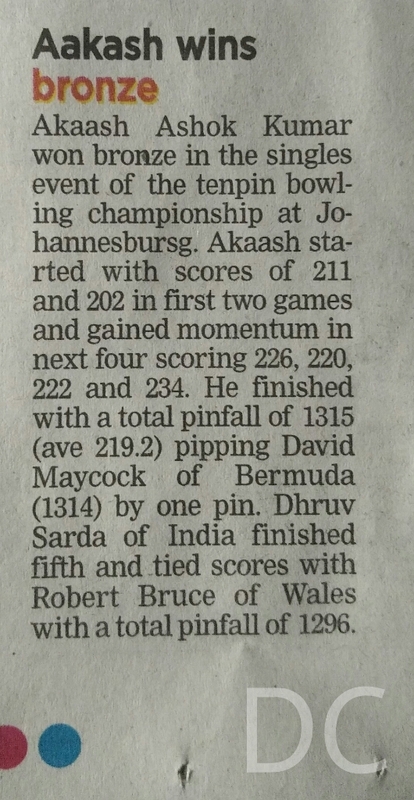 India Team comprising Prathima Hedge, Akaash Ashok Kumar, Swapna Mitra and Shabbir Dhankot, made history on the fourth day of the V Commonwealth Tenpin Bowling Championship 2011 by finishing third against all odds with teams like Australia, England and Malta breathing down their neck, to win the bronze medal.